exactly as described, brand new condition, e.t.a. on delivery was 4-6 weeks, received in Australia in 2 weeks. Nice service all round thank you. A good book with very useful info, but I was hoping for some color photos or something so I could better identify edible plants, etc. There are only line drawings, which makes it hard to identify the plants, etc. I think there are newer more recent editions that one could find. I plan on trying to find one. This is core survival information and education, a good buy. This is core education that should be required for all.There is more than enough information here that has been proven time and time again that works. It will make you a better outdoors person, save your life and give you the information to make living off the land much easier.Small example, in the morning placing rags around your ankles and walking in high grass to collect the dew (water) off of the grass, so you can give yourself some drinking water.The manual is written to help ensure understanding, which is great for this type of stuff.Overall and very good buy. This remains an excellent buy, the information enclosed, essential fundamentals.This edition does not have the slick color illustrations of what is edible and what isn't that the original does.This does nothing to diminish what it DOES contain. 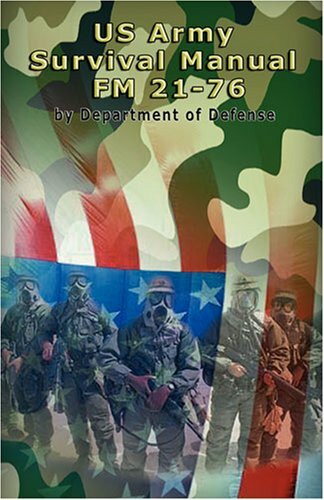 The U.S. Army Survival Manual: FM 21-76 although written in 1970 is still a valuable resource if you are able to decipher the valuable information from the not so valuable. A word of caution that some of the material is outdated and there have been significant advances in technology and gear. Many of the drawings aren't too bad although color photographs would be a very beneficial update to replace the drawings. Chapters 1 and 2 on the Will to Survive and Survival Planning are a good introduction that really doesn't change much with time. Gear and technology may change but the fundamental principles remain intact even with the passage of time. Chapter 4: Survival Medicine would really benefit from being updated. There have been significant changes in medicine and medical procedure since the writing of this book. I would recommend skipping this chapter and instead taking either a first aid course or an emergency medical technician (EMT) course to learn the latest and most effective medical procedures available. The chapter on Wild Plants for Food is a bit short in length and detail. This is one of those areas that you don't really want to make a mistake or you may pay a hefty price with gastrointestinal problems such as vomiting, diarrhea, dehydration or severe stomach pain. Skip the plants and go for meat as it is much more nutritious, provides better caloric intake and valuable protein. The chapter on shelters is good although at times you may feel that some information is lacking and you need more specific detail. This chapter will expose you to many different types of shelter that are commonly used in survival situations. Most are still very relevant and useful today. Overall, I would recommend this book as a starting point to obtain basic information. There is a lot of information although you will need to conduct further research and practice to see what works, what does not work, along with the ins and outs of the minutia of survival. Good luck. Book is good source for medical knowledge in bad situations, it doesn't take the place of actual classroom and hands on instruction, but if you have neither, this is a good reference. Don't be foolish. Everyone should purchase and read this book for whatever, whenever. You never know, it could save your own life. 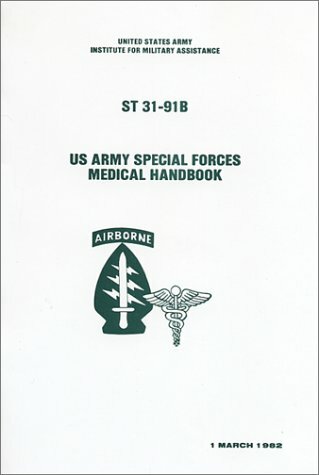 Special Operations Forces Medical Handbook by Steve Yevich I have used it extensively and it covers just about everything you could need. If you are looking for books for an Aid Station or for use out of an operating base Tintinali's Emergency medicine text book is excellent, there are many differing opinions on the surg books so ill leave that one alone. Few people get hurt more often than military members, and they are very imaginative in the ways they find to damage themselves. (Like the drunken [guy] who rocked a vending machine while trying to steel a pop, and instead got the whole machine which smashed him flat. )Whereas there was not a lot his buddies could have done for him, most of the injuries I see could have been ameliorated had someone known what to do.I wish more people knew more about basic first aid.Many times, when people die in car crashes or whatever, the person could have been saved with some very basic, very easy steps.Stop the bleeding, open the airway, etc.Please read this book.Sooner or later, the little things you learn will almost surely come in handy.I'm tired of seeing injured people totally untreated until the ambulance arrives when there are often a dozen or more adults around who just do not know what to do. My first assignment in the Army of the 60s was in an Armored Division headquarters near Stuttgart (4th Armored Div) and my recollection of the monthly intel briefings and that everyone has a responsibility to be aware of the surroundings whether on post or off.I returned to Germany almost thirty years later as a civilian (GS) and the warnings hadn't really changed except for the terminology and some computer related issues.Lee McCaslin does a great job relating his time in Berlin and Heidelberg at the Headquarters of US Army Europe.My recommendation is that the book be required for all Intel officers, NCOs and civilians assigned to intel units worldwide.Perhaps when more declassifications occur, Lee McCaslin can issue eiher a sequel or second edition with deleted information. 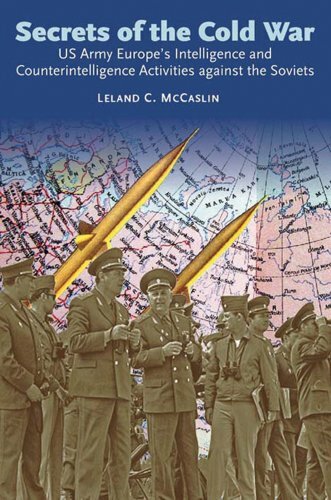 As one of Lee's compatriots, I welcomed the news that Lee was fulfilling his long-time desire to write about the cold war.We were both fortunate to work and practice our trades within the Army Headquarters in Heidelberg, in addition to serving at other "cold war" posts. I greatly appreciate Lee's effort, which brings to mind my involvement in many of the same activities, not to mention many other similar activities which are still cloaked by the mists of time and security. Congratulations, Lee, and Thank You! I had read a fair bit on the German airborne arm, the legendary Fallschirmjägers, but I had read very little on the American version until this book by Gordon Rottman. It contained a number of surprises for me, first and foremost the debt owed to the famous Billy Mitchell. In October 1918, as a Colonel in the US Army, he put forward the plan to train the US 1st division in parachuting techniques, and to be dropped behind German lines by heavy bombers as part of the planned 1919 Spring offensive. The end of the war in November 1918 put paid to this plan, however the seeds were planted for the future. Colonel Mitchell had the forward looking idea to supply these men by air-dropping supplies, and using ground attack aircraft to prevent German use of approach roads to the drop zones, enabling the 1st US division to fortify their bases. 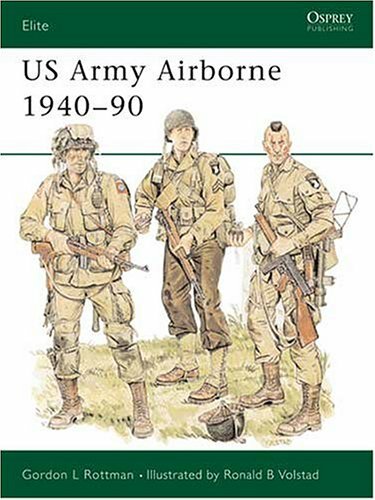 The book then runs through the creation and formation of the various US Army and Air Corp airborne units, the success' and failures of these units in North Africa, Sicily and the Pacific, leading up to D-Day and Market Garden, followed by the Ardennes and through to Germany's surrender on 8.5.45. Next comes the years after the war, followed by Korea, Vietnam and beyond. The photographs are excellent, and as usual, Ron Volstadt has provided high quality colour plates. A great book for the casual and dedicated reader of military matters. I think that the illustrations were 1st rate. As I was in the Army during the "Army Of Excellence", I thought Mr. Rottman had a couple of good points. But I also think that some of the problems faced by the Officers Corp should of been addressed like the zero defect mentality and the fear of making a mistake by Junior Officers. Also the up and out program that has a very bad effect on the ethical standards of Army Leadership which fosters way too much careerism in my humble ex enlisted man opinion. 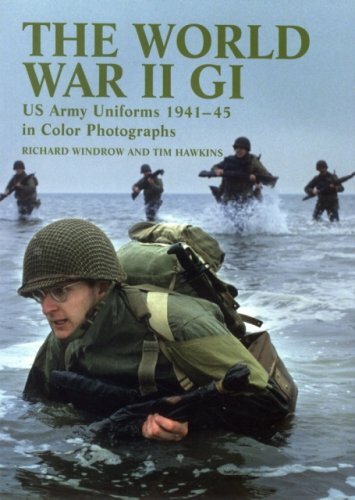 The widespread interest in the American soldier's dress and equipment in World War II has never before been served by a major book recreating the GI's appearance by color photography. A striking study that takes techniques to a new level; live models, wearing an enormous range of authentic surviving uniforms. This book will be hailed as a "bible" by militaria collectors, modelers, illustrators, film wardrobe departments and anyone with an interest in World War II soldiers. Superbly illustrated with 280 color photographs. Richard Windrow is a life-long military modeling hobbyist and Tim Hawkins is an experienced military photographer. New in paperback for 2008. I already own Khaki Drill and Jungle Green, WW2 Tommy, American Web Equipment, and the British Web Equipment books.This book is a fitting match to the WW2 Tommy.Unlike the HP Enjames GI Collector's guide, this book shows the uniforms being worn.While not in any way, a collector's book, this book shows 90% of the uniforms worn during the war.My father is a Pacific Theater WW2 veteran and I have pictures of him in many of the uniforms shown. I mam a member of a WWII living history team-our main reason for doing this team is to honor the Veterans of the Military -Mainly WWII -for all they have done to give us the FREEDOM we now enjoy. We do as many things possible to honor these Vets,Parades, displays,attending to their wants-VA hospitals, etc. Purchased this book for a graduate history paper and was able to use the valuable information. US Army Forces in the Korean War provides detailed descriptions of the Army's organization during the Korean conflict.The book has many charts and tables laying out unit's manning and equipment tables.The order of battle tables for all Army divisions that took part in the conflict alone are worth the price for the serious Korean War buff or veteran as they provide detailed lists and dates of service for assinged and attached units.In addition, the book gives an overview of the conflict, Army tactics, equipment and doctrine of the period.There are plenty of maps to orient the reader to the conflict, and the book is well illustrated with photographs.My only minor complaint is the small size of some of the photos.To its credit, the book covers not only combat units, but support and service support units are also described.This book has a ton of information on the US Army in the Korean War at an affordable price, you will not be disappointed. Retired US Army Colonel Donald W. Boose, Jr. provides an authoritative survey of the composition and doctrine of the US Army in the Korean War in Osprey's Battle Orders #11. 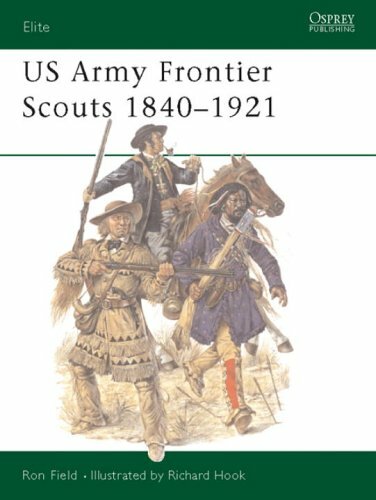 Readers looking for detailed line and block charts of various US Army units in this period, as well as details on tables of organization and equipment, will be well satisfied with this volume. However, readers should note that the omission of US Marine, UN and ROK units (which were often attached to US units) renders this account a partial one. 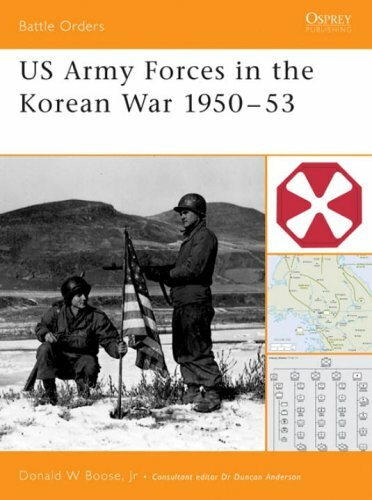 US Army Forces in the Korean War 1950-53 begins with introductory sections on the mission of US Army units in Korea, doctrine and training. In these sections, the author notes the gradual desegregation of the US Army in 1950-51 and the introduction of KATUSA augmentees. The heart of the volume lies in the 23-page section on unit organization, which details US units from 8th Army down to battalion level. Although Boose admits that he focuses on combat units at the expense of support units, some omissions probably required greater clarification. For example, Boose notes the Regimental Tank Company owned two medium trucks for mess and supply, but this clearly did not encompass fuel and ammunition resupply. This is no small issue. Even thirty years later, when my tank platoon in the 2nd Infantry Division in Korea was attached to an infantry unit, we had major problems getting fuel and ammunition since the infantry supply structure was not configured to support our requirements. This volume has eight 2-D maps: the Korean War. Phase 1 (delay and defense); Phase II (counteroffensive); Phase III (war of movement); Phase IV (static warfare); UN offensive operations, September-October 1950; 8th Army advances north, 1951; corps boundary shift, April 1952; Korea communications zone, 1952-53. The author also includes numerous line and block charts on units from army to battalion level. Other sections cover weapons, C3I and unit status (a thumb-nail history of all major units in Korea). There is a wealth of information in these pages. Although this volume is not designed to address the operational aspects of the war in much detail, I did have the sense that the author was soft-peddling the multitude of US setbacks in the war. The virtual destruction of the 24th Infantry Division in July-August 1950 (including the capture of its commander) get virtually no mention here. The 2nd Infantry Division's defeat in November 1950 - one of the greatest one-day losses in US military history - appears as a "setback." Further US defeats in early 1951 also are barely mentioned. Boose tends to ascribe early US problems to understrength units but there was a lot more to it than that, including poor air-ground cooperation at the start, unrealistic training and a condescending attitude toward the KPA (a mistake the US repeated by underestimating the Chinese troops). The fact is that the US Army was initially unprepared for a tough ground war in Korea and was often outmaneuvered and outfought in the early months of the war. Boose also tends to repeat inaccurate shibboleths, such as "movement was restricted to roads and streambeds." Although often described as "poor tank country" by non-armor officers, the fact is that armor can go just about anywhere in Korea, if the crews are daring enough. When I served as an armor officer in Korea, our tanks - which were much larger than the Korean War-vintage models - could go up some very steep slopes and through very narrow defiles (sometimes scraping rock on both sides). At any rate, Colonel Boose's volume is an excellent reference on the US Army in the Korean War, but its incompleteness suggests that it would best be used as an adjunct to other, more complete sources, such as Clay Blair's excellent history of the war. This gem of a book is packed with rare photographs and details the colorful careers of dozens of famed and little known scouts and their backgrounds. This book provides detailed information about how US Army units were organised and operated in America's longest war. Vietnam Special Forces veteran Gordon L Rottman examines the different types of infantry battalions and the units that supported them, their training and organisation down to platoon level. Aspects of the US Army's conventional and unconventional warfare doctrine are also addressed, along with a discussion of how replacements were trained and integrated into units. Among other areas of the US Army's involvement covered are individual and crew-served weapons, artillery, armoured fighting vehicles, transport, logistics, the complex chain of command, and combat operations. *The 1st Brigade, 101st Airborne Division didn't arrive in Vietnam on 29 July 1965 because the 101st Airborne Division didn't have a 1st Brigade in July, 1965. The 1st Brigade (Separate), 101st Airborne Division arrived at Cam Ranh Bay, South Vietnam on July 29, 1965. 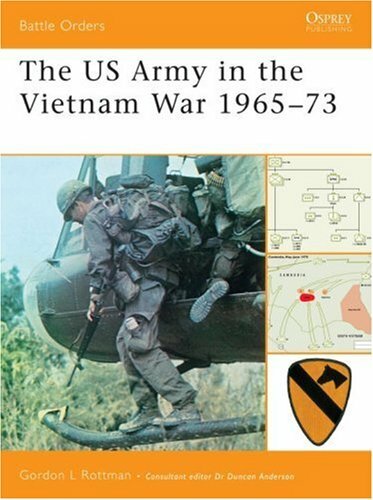 The 1st Brigade (Separate), which came to be known as the "Nomads of Vietnam" (not the Eagle Brigade), wasn't comprised of "troops being drawn from other divisional units" as the author asserts. All of the brigades of the 101st Airborne Division were under-strength at that time and a number of replacements were added to the brigade prior to deployment. This was, and is, a standard procedure within the U.S. Army, as it is with most armies. The authorized strength of a battalion in the 101st Airborne Division in 1966 was 792 but by 1968, that was increased to 920. 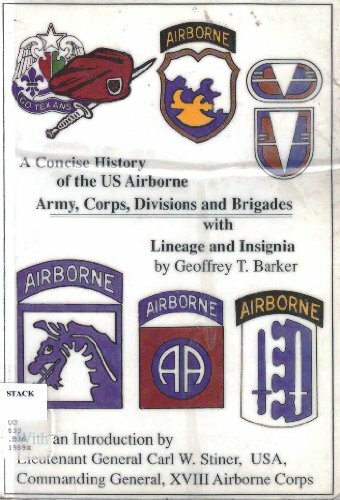 This is indicative as to just how thin the long green line within the 1st Brigade (Separate) really was-short one maneuver battalion, several support units, and 128 men in each infantry battalion by the U.S. Army's own subsequent reckoning. *Rottman fails to mention that the 173rd Airborne Brigade "Sky Soldiers" was comprised of four maneuver infantry battalions and was commanded by a brigadier general. The 1st Brigade (Separate) was commanded by a colonel (later a brigadier general) and had only three maneuver battalions. This made the 1st Brigade (Separate) very maneuverable, which is why General Westmoreland used it as his "fire brigade." It never failed him, no matter how outnumbered. The brigade was always under-manned, under-equipped, and under-supported. Despite this, by January, 1966, the "Nomads of Vietnam" had the highest operational tempo of any U.S. Army or U.S. Marine Corps unit in country, and that included the larger 173rd Airborne Brigade and the much, much larger 1st Air Cavalry Division. *Rottman makes the mistake of implying that the 1st Brigade (Separate) was physically where the base camp was according to the official records. In point of fact, the "Nomads of Vietnam" arrived on 29 July 1965 and didn't even establish a base camp until November, 1965. This was due to the pace of the 1st Brigade (Separate)'s combat operations which allowed no one to spare for such a frivolity as a base camp, unlike every other combat unit in South Vietnam over the duration of the war. *Within days of debarking from the USNS General Leroy Eltinge, elements of the 1st Brigade (Separate) began combat operations. Prior to leaving the United States, the then S-3 Operations officer, Major David Hackworth allowed the USNS General Leroy Eltinge to unit load the brigade's equipment, rather than combat load it. This meant that essential supplies, such as water and water tankers ("water buffalos") and ammunition, were on the bottom of the holds, and therefore the last to come off the ship. Being unacclimated to South Vietnam's summer heat and after days of inactivity aboard ship, a large percentage of the 1st Brigade (Separate)'s soldiers wound up as heat casualties. *On 22-25 August 1965, the "Nomads of Vietnam" descended upon Qui Nhon for Operation HIGHLAND. Lasting from August, 1965 until 1 October 1965, the 1st Brigade (Separate) cleared the passage to and the area of the base camp for the 1st Air Cavalry Division. Unlike the "Nomads of Vietnam" upon their arrival, the 1st Air Cavalry Division arrived to a carefully pre-selected base camp, and a covering force to keep them safe. To do so, the "Nomads of Vietnam" had to clear the infamous Highway 19 and, by heliborne assault, the famous pass wherein French Mobile Group 100 was virtually annihilated. Twenty-three separate company or larger-sized operations were conducted by the "Nomads of Vietnam" during this period, to ensure the safe arrival by the 1st Air Cavalry Division. In the event, there wasn't a single 1st Air Cavalry casualty while under the protection of the 1st Brigade (Separate). *During Operation GIBRALTAR, planned personally by Major David Hackworth, the 2nd Battalion, 502nd Infantry (Airborne) made a heliborne assault into a landing zone later determined to be a main force Viet Cong battalion command post. Unfortunately, Major Hackworth placed his supporting artillery out of range to support the paratroopers on the ground, who were outnumdered, completely surrounded, and without means of either support or reinforcement. The artillery was placed to fire upon where Major Hackworth expected the enemy to be, and there was a river to deep for fording, between where Major Hackworth positioned them and the closest position from which they could support the paratroopers in the very heated battle. The 1st Brigade (Separate), as small as it was, had no organic aircraft. The U.S. Army aviation company supporting this operation had every one of its aircraft shot down. Only one and a half companies landed in the landing zone, the others being waved off by a captain, who was later killed, as were most of the officers and NCOs. The battle went on for three days and in the end, there were 226 unrecovered enemy bodies on the field of battle. The 1st Brigade (Separate) had given the United States (including both the U.S. Army and U.S. Marine Corps) its first victory over a Viet Cong main force unit in the Vietnam War. (Note: A main force unit was a full-time unit, essentially "regulars", listed in the Viet Cong Order of Battle, but trained and closely advised by, and often under the command and control of, the North Vietnamese Army.) This battle has always been overshadowed by the Ia Drang Valley battle fought shortly thereafter by the 1st Air Cavalry Division and made famous by the book and movie "We Were Soldiers Once....And Young." 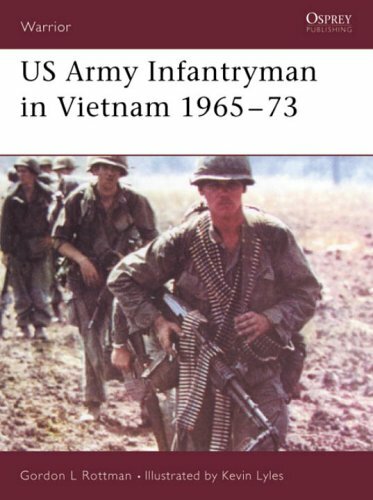 The only difference between the two battles was the size of the two U.S. Army units involved, the "Nomads of Vietnam" being smaller, and the subsequent publicity given the 1st Air Cavalry Division Ia Drang Valley battle. The two authors of the book even dismiss the battle fought by the 1st Brigade (Separate), to their own discredit. *Headquarters Headquarters Company, ("Tiger Force") 1st Battalion, 327th Infantry (Airborne) was formed as a task force as a result of Major Hackworth's blunders on Operation GIBRALTAR. After he returned from self-imposed exile in Australia and then New Zealand, to avoid Federal criminal indictment; he re-invented himself as an American "hero" rather than a leading anti-American and anti-nuclear advocate. Hackworth claimed to have created the Tiger Force. That is a lie. Hackworth wasn't yet relieved from the S-3 billet and wasn't even in our battalion. Tiger Force was created by the 1st Battalion commander as a special operations task force, in order to avoid just the type of fiasco that happened to the 2nd Battalion, 502nd Infantry (Airborne). If anything, Tiger Force was created due to Hackworth, not by him. *In November, 1965, the "Nomads of Vietnam" rolled into Phang Rang and established a base camp. They set up tents, cots, and retrieved their duffle bags from connexes where they had been stored since their arrival in South Vietnam in July, 1965. Days later, the "Nomads of Vietnam" rolled back on out and were flown down to the base camp of the 173rd Airborne Brigade at Bien Hoa, where they staged before road marching down to Di An, in the area of operations of the 1st Infantry Division ("The Big Red One"). One of the more interesting missions that the Tiger Force participated in was a "box-me-in" fire mission in this area of operations prior to Christmas, 1965. One night, a small Tiger Force patrol was ordered to conduct the above type of mission. As related to this reviewer by a participant in this patrol, he was under his poncho with a red-lens flashlight. Other members of this patrol were strategically positioned when a body of North Vietnamese Army soldiers began to come upon their positions. They were so close, they could smell them and in time, this small patrol was completely surrounded. It was then that the massed artillery of the entire 1st Infantry Division commenced in a "time-on-target" fire mission. Few artillerymen see that done even once in their entire career. The microphone on the Tiger Force patrol's PRC-25 was held up in the air and keyed so the entire 1st Infantry Division artillery could hear the North Vietnamese Army soldiers dying, yards from where the Tiger Force patrol was laying in wait and concealed by their ponchos and the darkness of the night. It was soon after this engagement, that the "Nomads of Vietnam" went back to Phang Rang for Christmas. *Phang Rang was 175 miles north of Saigon and it was a mile-square base camp located on coastal shrub land. Except for a small contingent of support troops, the sick, the wounded not yet ready to return back into combat, and incoming replacements; in two years this base camp only saw the assigned units for a total of 21 days. But for three weeks in two years, the 1st Brigade (Separate) were in combat. In point of fact, the "Nomads of Vietnam" saw more time in continuous combat than any other unit in the history of the U.S. Army. *At My Canh II, on 7 February 1966, Tiger Force made the bayonet attack against concrete machine gun bunkers across an open field and into a trench line of North Vietnamese Army soldiers. A battle for which Major Hackworth was awarded the Distinguished Service Cross (DSC) from his vantage point on the other side of the river behind us. The rest of the soldiers of that unit were awared Purple Hearts. By thispoint in time, Tiger Force and the rest of the "Nomads of Vietnam" were just going from one operation to another; time and place running together in a mosaic of green foliage, red blood, and the wounded and dying. *At Dak To in June, 1966, the "Nomads of Vietnam" fought one of the most vicious battles of the Vietnam War. As one of the seasoned brigade veterans said upon getting off a C-130 at the airstrip alongside the Special Forces camp at Dak To: "I've never seen Dien Bien Phu, but this looks like the description." It did, it was, but this time it was a defeat for the 24th North Vietnamese Army Regiment. At the end of the battle-day and night, from bunker to trench line, to spider hole, to bamboo thicket, in a non-stop green hell. Vicious firefights from both sides of a steam bed, by men weakened by thirst in desert temperatures in a jungle hell, but unable to get precious water from the stream....and still be alive to pull the canteen from the water. Tiger Force, down to not very much more than a reinforced rifle squad, was hit by a two company North Vietnamese Army attack, which was first beaten off and then followed by a counterattack. Defensive perimeters were so small that some helicopters had to come in almost above the positions to prevent killing our own wounded or being hit by enemy ground fire while dropping much needed ammunition through the thick jungle canopy. Many of the paratroopers were down to only three or four rounds of ammunition while listening to the NVA preparing yet another attack. When the battle was over, the surviving members of the "Nomads of Vietnam" looked the survivors of Guadalcanal. The opposition, the 24th North Vietnamese Army Regiment was destroyed. They suffered more than 1,200 KIA or killed in action. Lt. General Stanley R. Larsen, then commanding general of i Field Force, Vietnam publicly declared the 1st Brigade (Separate) to be "the best fighting unit in Vietnam." President Lyndon B. Johnson assigned to Tiger Force the title "elite", the only U.S. Army unit ever to be so designated by a President of the United States. *Apparently none of this means anything to Rottman, however. He doesn't mention any of this. Indeed his history of this unit makes no sense at all. This is a writer out of control, he isn't a scholar and his credentials have been made more arcane over the years, to the point wherein it can be suggested that the publisher's biographical summary may be technically true, but it isn't honest. *Rottman also appears not to mention unit awards, which for the 1st Brigade (Separate) alone during the period of 1965-1966 includes, but isn't limited to the following: Presidential Unit Citation (Army) for Dak To, Vietnam 1966; Valorous Unit Award for Tuy Hoa; and Meritorious Unit Commendation (Army) for Vietnam 1965-1966. A good scholar or a good military historian simply doesn't go to one or two sources and doesn't copy that information by putting it in his book. That is called plagarism. I also have talked to two well known military historians who have given Rottman photographs and information from their personal collections. Both individuals stated to me that he was only allowed a one time use of this information and photographs and to give them credit for providing it but Rottman has used it more than once (I have documented this and sent it to a well-know publisher for possible legal action) and he fails to give them credit. All information needs to be confirmed and Rottman's Order of Battle (OB) for the 101st Airborne Division is wrong. There should be one for the 1st Brigade (Separate), 101st Airborne Division and another for the 1st Brigade, 101st Airborne Division, effective the date that the 1st Brigade (Separate), 101st Airborne Division stood down and was immediately re-constituted as a maneuver brigade of the division. For, until that very moment, the brigade commander held an independent command and stood equal to the division commander, in fact not in rank. 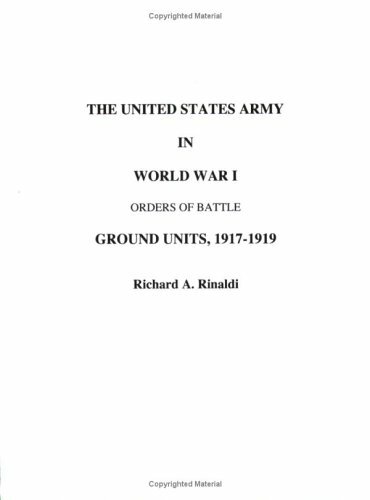 As an Order of Battle (OB), Rottman's book also misidentifies unit designations and fails to indicate when some of these units joined the brigade. Not all the units cited by Rottman deployed with the brigade originally. If the entry for the 1st Brigade (Separate), 101st Airborne Division is indicative of this book, Osprey needs to pull this book, before it impeaches its own integrity and credibility, which Rottman has been pushing to the breaking point. Rottman no longer has any credibility as a scholar. He, at best, is a technical writer who needs to be followed around by a committee of fact checkers. If this entry is typical, this is one very bad book. Bomb threats, anthrax scares, and the fear of nuclear warfare. Gas masks, duct tape and big bottles of water fly off the shelves: today no one feels secure. And that doesn't even take into account "ordinary" emergencies. With this authoritative field guide on hand, you'll have all the information you need to survive a variety of disasters. Originally commissioned by the Department of the Army to train its special forces in all-climate, all-terrain survival tactics, the manual describes situations and illustrates solutions that could mean the difference between life and death. Find out how to make polluted water potable, improvise containers for boiling food, build shelter, treat illness and injuries, find direction using the sun and stars, foretell the weather from the clouds, and more. Full-color photographs and detailed information help you identify poisonous snakes, as well as edible and non-edible plants. Special guidance is given on surviving in the desert, the tropics, the Arctic, and at sea. A must for campers, hikers, explorers, pilots, and anyone who wants to know how to survive in primitive conditions. People just love to complain. This manual is NOT out of date. It has served and is still used by the United States military. Soldiers as well as civilians have survived using the time-tested knowledge cointained in this book. Wilderness Survival has not changed. The techniques been used for thousands of years, they are used today and will be used long after we are gone. Most of the drawings are in black and white, they are vivid drawings and you can easily understand it.There's also a lot of beautiful edible plans photos that you won't see in most other survival manuals.I spent $8 on this book and I think it's really worth it. This book does not address current survival situations (Natural or manmade). I recommend a book which would be fresh and offer tips on urban and rural survival as most will not have access to wilderness to "live off the land". Mr. Ron Foster offers a guide of firsthand knowledge (he is a first responder and trainer of such) that could save your life wherever you live when catastrophy hits without tons of survival gear. Just google Rural Ranger and read about it. Amazon carries it also. BE PREPARED PROPERLY! If you look at what the publishers says: Publisher: Barnes & Noble (August 15, 2003) This book was NOT printed in 2003 the book is from 1969.Don't let them take your money for nothing! Like the outdoors??? Hiking, camping, fishing, backpacking? You need this book with you at all times when you are out there. It contains all kinds of life saving information that is invaluable if something bad were to happen to you out in the wilderness. The appendix features full color pictures of both edible and dangerous plants, poisonous snakes, and cloud types for forecasting impending weather conditions. I haven't read the book in question. It may or may not provide useful information to future officer candidates. I am currently going through Army Officer Candidate School (OCS) at Ft. Benning and my class is scheduled to graduate on September 2, 2010. I wanted to offer some helpful advice for future candidates. 1. Make sure you are physically fit. 2. Before OCS starts, take care of any business that is normally done during business hours as you won't get much of a chance to do it once you start OCS. 3. Depending upon your situation, it could take as much as a month or two before your first paycheck. 4. The UPS store at the main PX has a slide book for the OCS classes. I found it useful. 5. Before OCS starts, make sure you have everything on the packing list (available online). You'll be issued stuff like uniforms, boots, camelback, etc. but a lot of the little stuff like pens, paper, flashlight, etc. you'll have to get on your own. 6. Before OCS starts, try and memorize as much of the material as possible from the required knowledge section in the OCS syllabus (available online). 7. Take care of yourself and keep yourself from injury (especially from being a heat casualty). I've read the book front to back virtually without being able to put it down.I've read other reviews about it.Yes, at times it does speak the reality as we'll tend to say about what we're doing in our daily life.But do we really mean it, NO!Okay, some of it maybe but not all of it.If we're to actually mean what we say about our work then we wouldn't do what we're doing day after day. If at all, it gave me an inside view of the BCT and OCS which I plan to do in early 2011.This isn't the book that will tell you how many push ups and sit ups you need to do or what kind of physical and mental shape you'd need to be in for the BCT.This is more of a dairy of a soldier going through these training.Although I'd say it may prepare you mentally, I'd think, since I haven't been there yet. A great OCS guide for potential candidates! I'm prior service and I've thought about going to Army OCS. I've read the Army Officer's Guide 49th Edition and other required reading recommended from the OCS website, but I never came across someone's personal experience that was so detailed. This book is everything I've been looking for as an idea of what to expect. Some people may criticize Capt Mann's motives, but I look at it from a different perspective. This is his interpretation of OCS and his own personal account of what he endured. I simply just replace his motives with my own as a read the book. He arrived at Ft. Benning unsure of his decision to join the Army, but he persevered and is a better person today because of his challenging journey. It has prepared me so much for the mental and physical aspect of what OCS can be. My experience in OCS could be different, but I'm sure there will be some similarities. I believe that's the whole point. Ft. Benning is a special place where you enter as a common citizen and you leave as a dedicated soldier. I recommend this book for anyone who is considering the 09S OCS route for commission as an officer in the U. S. Army. I can't wait for volumes II and III! I went through Marine Corps bootcamp over 16 years ago and I continue to serve in the Army Reserves today. After all these years I could still relate to this book. 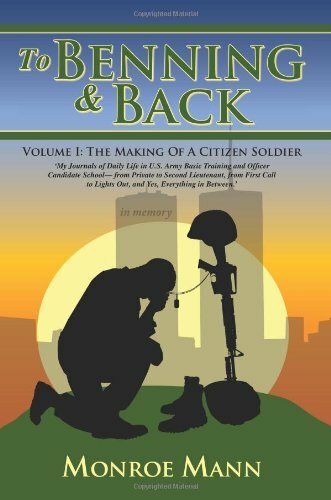 This unique book shares the trials and tribulations shared by all who experience bootcamp or basic training regardless of the branch. I highly recommend this book to anyone who is considering joining the military or who is simply interested in the military experience. I look forward to reading volumes II & III as well as other books by Monroe. Also,check out his website at [...]. Monroe Mann's journal, To Benning And Back, is a personal diary of his experiences at the Army's two most physically and mentally challenging schools. Not just a personal diary, it's an intimate portrait of one man's survival through basic training and the officer candidate school, seen through the indecisive eyes of a patriot and aspiring actor. I thought when ordering this book that it would be the typical story about a soldier who, despite all odds, achieves his goals and has his life projected into superstar status. Boy, was I close but there's more to it than that. Throughout Mann's experiences, we learn great insights into surviving and succeeding in the Army. The stories are good, the writing is amusing and the references are priceless. Lt Mann has saved many inquisitive soldiers hours of research in figuring out what it takes be an outstanding officer candidate. He does it with a sharp wit, criss-crossing his acting anecdotes with his experiences at Ft. Benning, GA. I know that for me, the book left me feeling more comfortable about OCS and more focused and passionate about themilitary than ever.I look forward to his next book! Enjoy!! Good attention to detail ! An excellent about the very complex story of the US Army Ranger and Long Range Recon Patrol units. Coupled with some outstanding illustration this is a good deal for those who are interested. Fantastic research and comprehensive details. 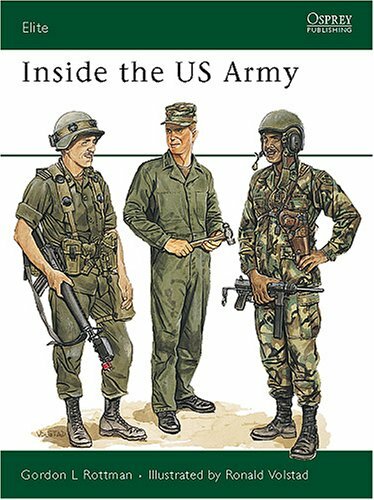 As a member of one of the units covered in this book by Gordon Rottman, I can say that the attention to detail is flawless and well researched.The artwork by Ron Volstad is impeccable - from the color of uniforms and equipment down to the handles on smoke grenades, nothing is in error. Having served with Sergeant Major Rottman (aka 'Gordo'), I can say that he is nothing if not thorough.His no-nonsense approach to all details is in keeping with the highest traditions ofArmy Special Operations. Excellent, a must for those interested in Ranger and LRRP. A more compact, its is 64 pages, well written and illustrated book on the Ranger and Long Range Reconnaissance Patrol (LRRP) units of the period will be hard to find.According to the author information, Gordon Rottman was a Special Forces weapons specialist in the 5th SF Group in Vietnam in 1969-1970.At the time of publication in 1987, he was a civilian contract Special Operations Intelligence Specialist at the Army Joint Readiness Center, Fort Chaffee, AK and, as a Reserve MSG, the Operations Sergeant of the Opposing Forces Group of the 75th Maneuver Area Command.Ron Volstad did the illustrations and, not to take anything away from the text, the illustrations alone are worth the price of the book. The book contains 10 pages of full color plates with 55 artist renderings depicting uniforms and equipment of Ranger and LRRP units of all eras from 1942 to 1987.The artist is very faithful in his capturing of the uniforms worn, including insignia, and the equipment carried by particular individuals.The artists illustrations are described in the last section of the book.Each picture has the specific items of clothing and equipment identified including the year of introduction of the item and its supply system designation (e.g. "M1 rifle with M7A1 grenade launcher and M15 grenade sight").In addition to the artist pictures, the book includes numerous photographs of the Ranger and LRRP units and individuals from the years covered. 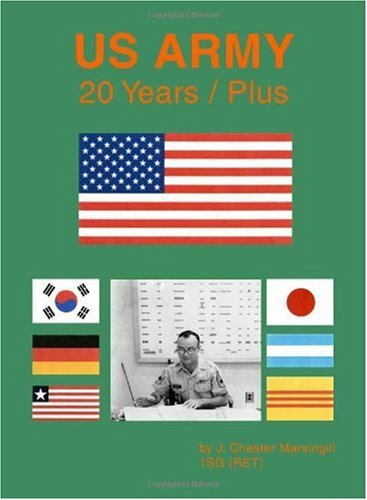 The section on the Korean War period is not as complete as it could be.However, the author did not have Bob Black's book "Rangers in Korea" (published in 1989) for reference.As it is, the book covers the Korean War period in about four pages and is a good summary. The author begins by relating the problems of Ranger organizations in all the eras covered in the book. "Their missions and capabilities have often been misunderstood, and their personnel misused.Ranger organization and missions have changed with each war, which has led to an additional problem - lack of continuity between the wars. "The author also illuminates the difference between Ranger-type organizations and LRRP units.Ranger-type units are intended for direct action missions against the enemy such as raids and ambushes.LRRP is used as a generic term to describe units tasked with passive deep penetration reconnaissance and surveillance missions. I am very impressed by the book and recommend it to anyone that wishes to get a concise look at Ranger and LRRP units and a brief summary of their history from 1942 to 1987. 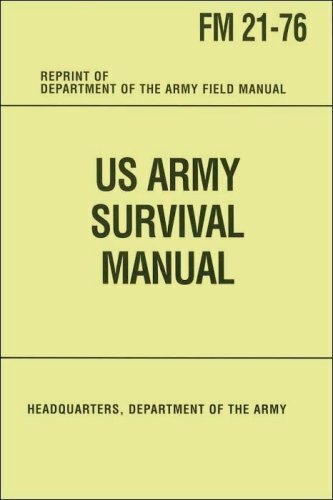 This manual condenses important information from a number of U.S. Army regulations, field manuals, and other publications into one crucial volume. 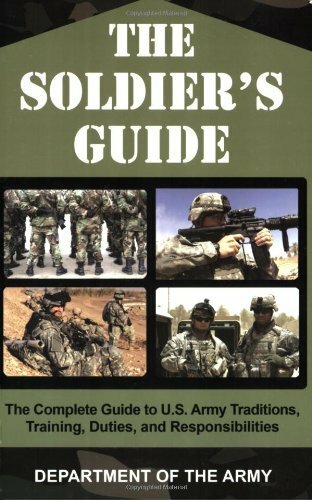 Written to answer the many questions asked by soldiers of all ranks in the Army, it covers everything from the history and traditions of the American military to training and service benefits. Find out about such ideals as “The Warrior Ethos” that drive soldiers during a mission and the Army’s values of loyalty, duty, respect, selfless service, honor, integrity, personal courage, and discipline. In addition, sections cover ethical reasoning, the basic principles of war, military courtesies, individual combat skills, and more. This book is a definite must read for anyone considering army life. It walks you through exactly what the military expects from its soldiers in the army. From training, personal morals, its history, customs, traditions... well, you get the idea and I don't really want to sound like the table of contents here. However, that said (and bearing in mind at the time of my review there were only 2 real options for purchasing a hard copy of this guide: 1 new for nearly $1000; 1 used for around $40), this publication is "approved for public release; distribution is unlimited." Simply hop to your favorite search engine and look up FM 7-21.13 "THE SOLDIER'S GUIDE". However, if a copy becomes reasonably priced, I would buy it. It was a much better reading experience having the book in my hands than the re-read I did from the internet, but, any port in a storm. I found this book to contain a vast array of useful information for anyone starting outin the U. S. Army. Information is laid out in a very user friend format. Many FM's were used as references for this book. It is a good overview and starting point.